except for factory reseting the printer which i cant find how. If i wont find a solution on these forums i'll literally take it to work and smash it with a sledge hammer. It's not asking for just paper, it is asking for a specific paper. It will also have a fault code that can tell you more. As for the cause, it could be that the driver is using normal settings, but someone put in the paper at the printer and set it to cardstock, in which case you would need to change the paper type at the machine back to plain (if that is whats loaded) or set the driver to print on cardstock instead of plain. Im getting code 024-963 everytime. It pulls the paper the shows me the error, and sometimes gives me a false jam. The thing is, if i try printing a few times it does after the 20th attempt, and if its a few pages then it doesnt print the second one. I've checked everything on adobe reader and on the printer and nothing changed. How do i factory reset this thing??? CAUTION: Modifications to the Reset Defaults settings should be performed by the System Administrator. Incorrect settings may cause the printer to become unavailable. Print a System Settings (Configuration) report before resetting NVM to obtain current printer settings. See the Related Content for additional information. Press the [Up] or [Down] arrow button until 'Admin Menu' is selected on the Display Screen, and then press the [OK] button. Press the [Up] or [Down] arrow button until 'Maintenance Mode' is selected, and then press the [OK] button. Press the [Up] or [Down] arrow button until 'Initialize NVM' is selected, and then press the [OK] button. The Display Screen will read 'Reset Defaults Are You Sure?'. Press the [OK] button. Wait until the display screen reads 'Restart Printer to apply setting'. Press the [Menu] button to exit. 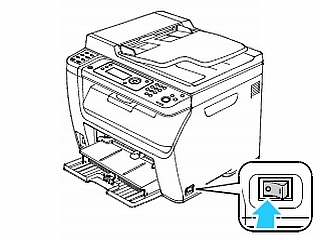 Power OFF the printer using the power switch located on the right side of the printer, toward the front. Press the power switch to the (O) position. Press the switch to the (|) position again. Print another System Settings report and compare it to the System Settings report, printed in step 1. If necessary, re-configure the printer's network settings and any other required settings. If necessary, open CentreWare Internet Services (CWIS) and enter a username and password again.